Recommended by Cats International “Bootsie’s Combination Scratcher™”. It’s great because it can be used for horizontal scratching or wall mounted for vertical scratching. It’s also excellent for smaller spaces. Let’s start with an understanding that scratching serves many useful and healthy purposes for cats, they need to scratch to stretch and exercise and condition their nails. Every home with a cat should have at least two cat-appealing scratching posts in high-traffic areas to allow for territorial satisfaction. You will notice some cats will run to their scratching post when they see you coming into a room or when they wake from a nap, they want to hear you tell them what a good cat they are, and please do phrase them! 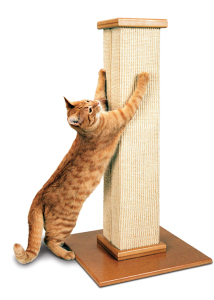 The post should be at least 32” high and you can build your own, please see our article on “How to build a Scratching Post”, or you can purchase one (see below). Place the post in front of the area where the cat has started to scratch, show him the post by scratching your nails on the post to get him interested. Don’t physically take the cats paws and hold them to the post, they will find this offensive and will avoid the post altogether. It must be the cats choice to use the post, it can’t be forced. 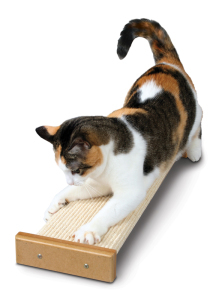 Our favorite post is “The Ultimate Scratching Post™” made by SmartCat, it’s the best available. If sprayed in problem areas on a regular basis, it will give the cat the impression that the area has already been marked—no need to scratch. It has a calming effect on the cats, use it to spray in a cat carrier before going to the vet, about 20 minutes before putting in the cat, it will give them a calming effect. It can also be purchased through the Doctors Foster and Smith Catalog (1-800-826-7206) or found at most pet stores. Use the back-side of the vinyl carpet runner, it has a very prickly feel, it can be cut and placed in the area that you want your cat to avoid, they won’t want to walk on the points of the carpet runner. Cats dislike perfume. An air freshener may keep the cat away from an area until it has evaporated. (Never put it near the litter box, scratching post, sleeping or a feeding areas). Scented dryer sheets may have the same effect.